I awoke to a milky morning, the kind that envelops you and cuts off all sound and distorts your vision as if you are playing blind man’s buff on a grander scale; the oft made journey to the hen house was eerily silent and almost claustrophobic. The fruit trees assumed height and breadth that did not befit their modest size and loomed suddenly out out of the mist as if they were dancing a grotesque and lumbering dance…….the rain drops dripped and the sound was amplified as I tripped my way through sodden grass and muddy tufts. Even the hens were loath to leave their straw strewn nests and venture into a cold and misty garden…..they normally burst out in a flurry of feathers, but today, they cautiously made their way to the feeding bowl and stayed close to their hut….nervously glancing at birds that swooped in to share their food. The misty morn eventually cleared and I decided that a baking day was in order, cold weather always brings out the baker in me and I am lured to the bag of flour as I make my way through to the pantry. It is at this stage that I had intended to post a gloriously simple photo of my dusky orbs of claret, or plums, tumbling out of a rustic basket onto a patterned table cloth of dusky pinks and magentas…..but I forgot my artistic intentions and stoned and cut them into quarters before I realised my error. So, you will have to marvel at them in a tumble for now, cascading in a carefree and totally unstaged manner……I really must do better next time. I love plums and damsons, in pies, jams, gins, sauces or crumbles……..but there is nothing more Autumnal and delicious than a vast tray bake studded with plums and flavoured with almonds…..it is a communal dessert, a warm and bosomy pud of the very best kind, a blousy and unpretentious sponge that brings smiles to the diners faces when it is triumphantly placed in the midst of the table. Non cake eaters and pudding loathers all ask to try “just a small” piece and children love it ~ once it has been dished up as a hot pudding, it is easily stored in an airtight tin for afternoon tea treats or lunch box delights, it’s a plum in the mouth marvel. Anyway, it is a rather nice bake to promote National Baking Week and Kate’s Autumnal Baking Challenge, as well as showcase local, seasonal fruit ~ and it also makes good use of my free range eggs, those of the golden hearts. It is also easy to make and freezes well after baking…..all in all, a good tempered bake. I have suggested that it makes 12 squares but I realise that my squares are rather hefty, so I leave it up to you how you portion it ~ 12 hefty squares or 16 reasonable ones, the choice really is yours……when served hot, you can of course adorn or anoint it with single pouring cream, custard or creme fraiche, it’s also wonderful when eaten naked ~ the cake that is and not you…….but again, that’s your choice. I hope you enjoy this as much as well do, other fruit can be used but the plums really do work so well with the almonds and cook into a jam like consistency whilst adding an oomph to the almond sponge cake. See you later, and make sure you put your wellies on when opening up the hens, and don’t venture out in fabric slippers, as I did again! Pre-heat oven to 180C/350F/Gas Mark 4; grease and line an oblong baking tray, 31cm x 22cm. Place all of the cake ingredients, excluding the milk, plums and flaked almonds, into a large mixing bowl and beat with an electric hand whisk until light and fluffy, about 2 to 3 minutes. Add a little milk to make a soft dropping consistency and pour the batter into the prepared baking tray, shake it to level it. Place the quartered plums over the top on rows, and then sprinkle the flaked almonds over the top before baking on the middle shelf for 35 to 45 minutes, or until the cake has risen and is golden brown….a skewer when inserted should also come out clean. Allow to cool in the tray slightly before cutting into squares and serving. Store the cake in an airtight container when cold. Can be frozen at this stage ~ defrost for 4 hours. …….there is always something delicious to eat in her kitchen! I also am wandering down to the hen house through the damp and misty orchard, but it's spring damp here, not autumn and my dear hens are just about past their best laying days so it is often an empty trip back to the house. I have a most prolific plum tree that hangs over the hen house door and will be tucking this recipe somewhere safe so I can bring it out in a few months time when my plums are ripe. Thanks. Karen, I would certainly opt for 12 hefty pieces, and eat 6 myself! It looks tempting, so if I can find some good plums I'll bake this lovely recipe next week. Plums and almost is a match made in heaven! I love to sprinkle with flaked almonds this creates a nice crunchy top! I love this post. My husband always laughs at my choice of attire for letting the chickens out. I think it reassures him that no-one will be racing to pinch me from him any time soon. That tray bake looks absolutely delicious. I am in need of new superlatives to describe your creations Karen. Yum always seems entirely inadequate and yet is exactly the word one wants. Yum! 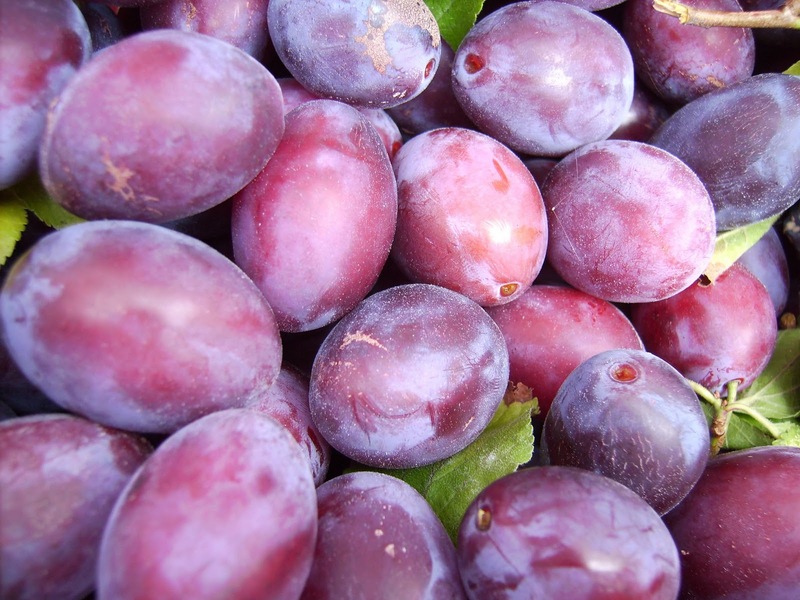 Plums are a wonderful fruit and certainly Autumnal. Ah, you paint a wonderful picture Amanda, Spring or Autumn, that early morning trip to the hen house is always eventful, or in the case of no eggs, potentially hopeful! Thanks Jude, hoorah for another hefty slice lover! Thanks Bee ~ you would bee happy with a slice of this! Thanks Sneige, it is a nice contrast with the crunchy almonds. Thanks Kath ~ you and me both, I had a short t-shirt nightie, an over coat and fabric slippers……a wondrous sight! Thanks Mary ~ I sometimes have more time to compose, today was that day! Annie ~ thanks,''twas a grand bake! Kentish Keg-Meg, thanks, they are Autumn in an orb! Oh that looks utterly delicious Karen – and what a beautifully written post, I could almost feel myself stumbling on the way to the hen house with you!! Oh my you are obviously in lyrical mood today Karen! Lovely writing and great photographs. Love those pudding cakes that do a double job, nice baking. I’d like to make the almond and plum tray bake. Looks lovely.